Captain Marvel and The Electron Thief! 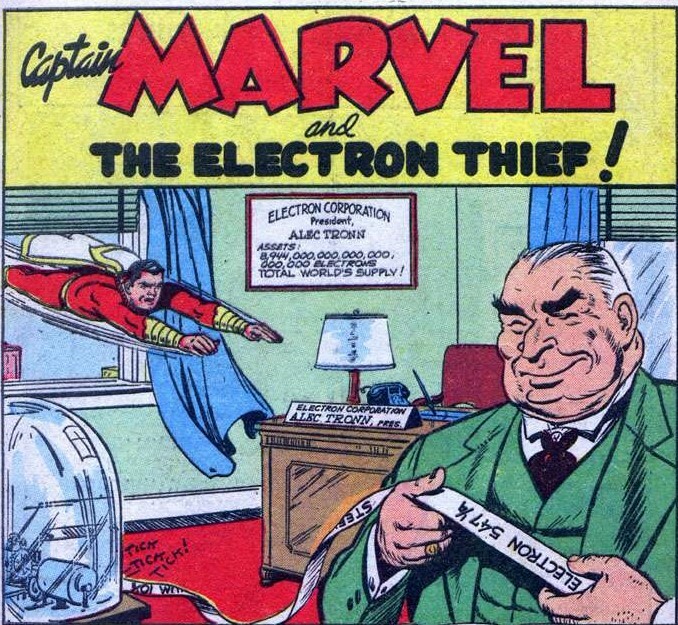 In Captain Marvel Adventures #87 (May 28, 1948*) we have a great story entitled "Captain Marvel and The Electron Thief!" 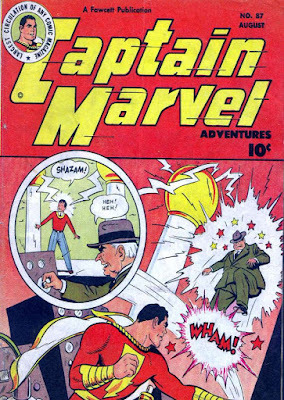 Captain Marvel battles villain Alec Tronn. Alec Tronn is the CEO of Electron Corporation and has taken control of the world's supply of electrons! I love the name of the villain - very clever! The story begins with Alec Tronn paying a visit to Sterling Morris at WHIZ station headquarters. Tronn demands Morris pay him $1000 an hour or WHIZ will go off the air! Morris and Billy Batson think Tronn is a crackpot and refuse his demands. Billy transforms into Captain Marvel, fearing Alec Tronn might get violent, and Cap escorts Mr. Tronn out the door. 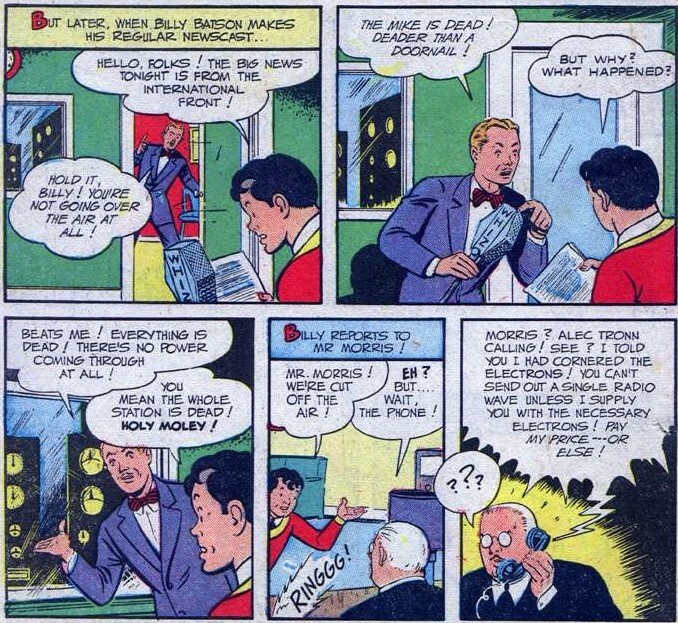 Later that day as Billy prepares his broadcast, they discover they can't transmit over the air! 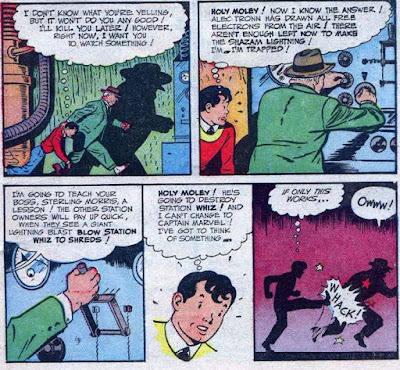 Alec Tronn's threat has proven real and he calls Morris on the phone and again demands payment for the use of electrons. Sterling Morris calls a meeting of radio owners and tells them of Tronn's threat. Tronn busts into the meeting and electrifies the crowd with a new demand! He will now sell electrons by the dozen, costing the radio owners $3600 an hour! Tronn advises, "You're in my power gentleman! Unless you buy electrons from me, I'll shut you all off the air!" 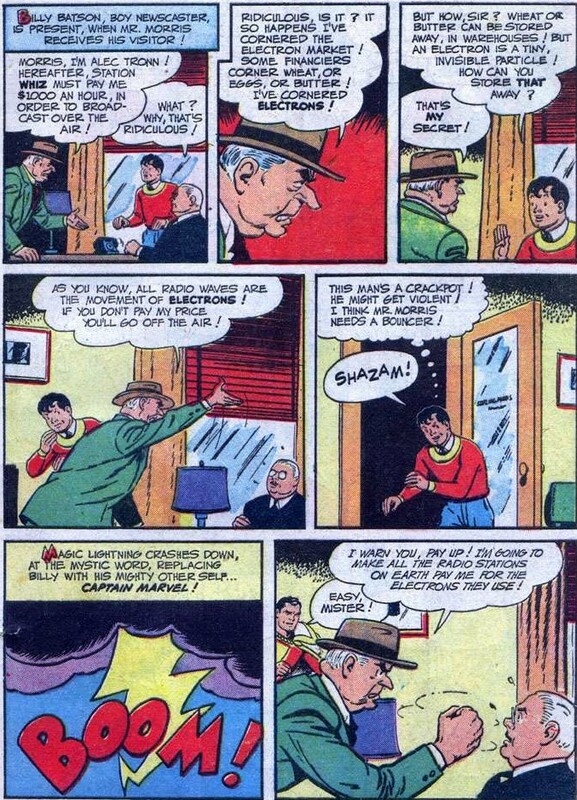 Billy Batson is in the room and thinks to himself, "It's against the law to corner the market in anything! 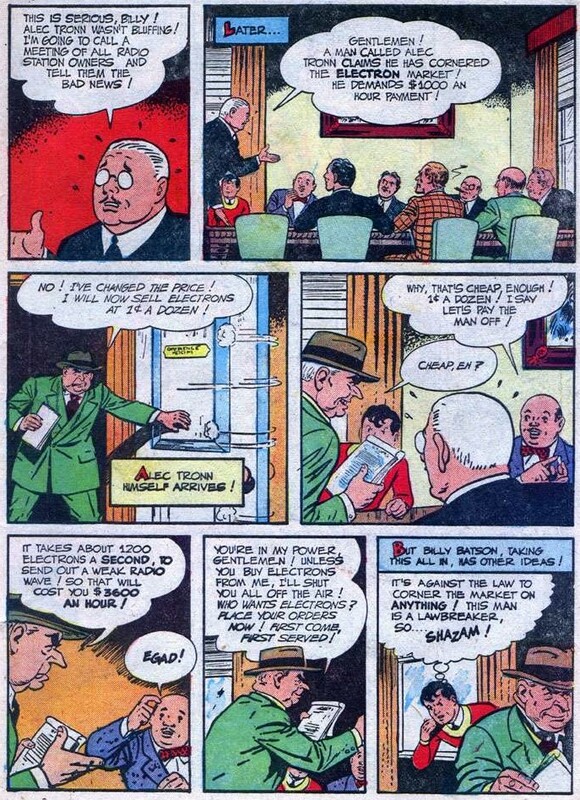 This man is a lawbreaker..." And by saying the magic word, "Shazam!" Billy is transformed into Captain Marvel. Captain Marvel advises Tronn he'll need to explain himself to the anti-monopoly commission. Alec Tronn uses a battery pack to create a bolt of lightning that whisks him away and takes him to his hide-out. Unbeknownst to Tronn, Captain Marvel follows him! 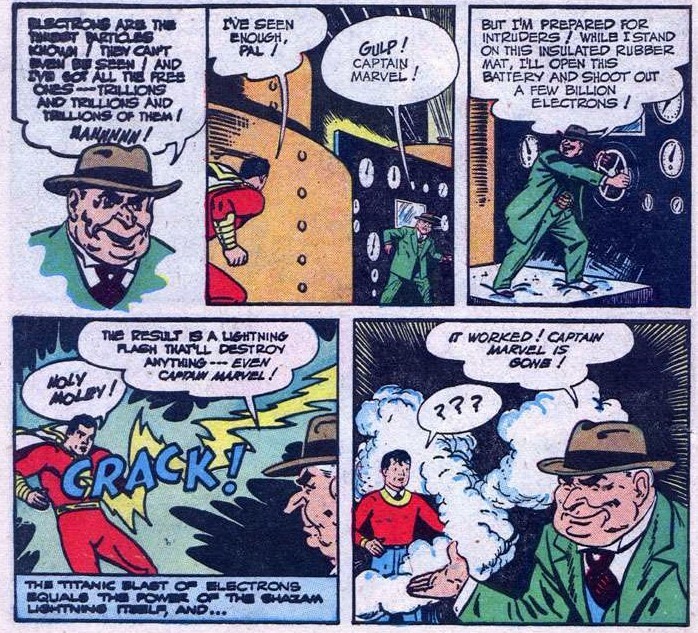 Captain Marvel gets the drop on Tronn, but Tronn zaps Cap with billions of electrons - equivalent to a magic lightning bolt - and this transforms Cap back to Billy! 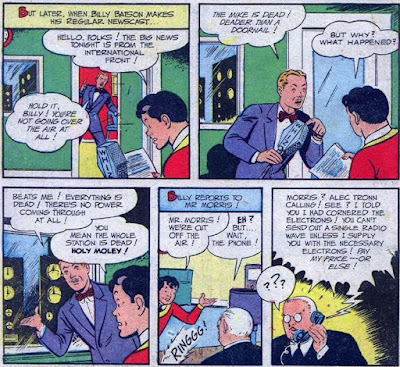 Billy says "Shazam!" but no magic lightning strikes because Tronn has taken all the electrons and there aren't enough to left to make the magic lightning needed for his transformation! 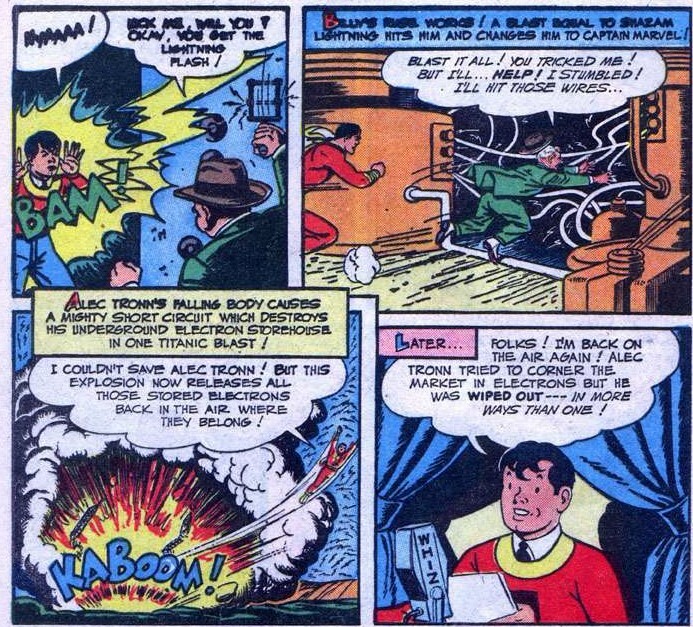 Tronn promises to kill Billy later, but wants to show him how he will destroy WHIZ with a blast of lightning. With this threat, Billy just can't turn the other cheek, so he kicks Tronn in the pants which makes Tronn angry enough to zap Billy with lightning - transforming him into Captain Marvel. 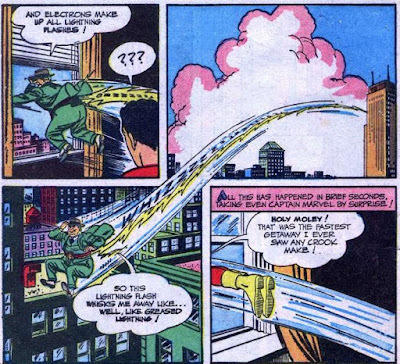 Alec Tronn tries to escape but trips and falls into wires. This creates a short-circuit that explodes Tronn's hideout and releases all the captive electrons back into the air! Alec Tronn is electrocuted, what a shocking end to the story. This was a fantastic story and I really enjoyed it. 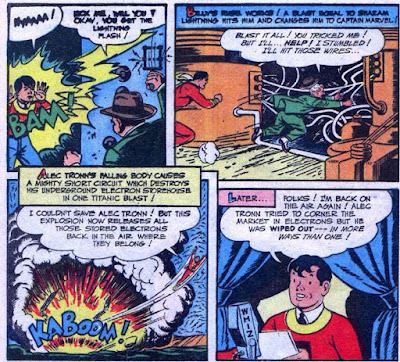 I loved the villain's name, Alec Tronn and how he escapes on a bolt of lightning. I like the action that is in it and the continuity of the magic lightning facts that Shazam lightning is far more powerful than regular lightning. I also like how Billy has to be creative and very brave to take a chance on getting struck by lightning so he could transform back into Captain Marvel. All in all this is a wonderful, whimsical Captain Marvel adventure that proves to be electrifying and entertaining!